They changed the ending on me and I’m not quite sure how I feel about that. I just read “The Secret Life of Bees” by Sue Monk Kidd which turned out to be a splendid read- not in any life-changing way but in a way that transported me to South Carolina in 1964. 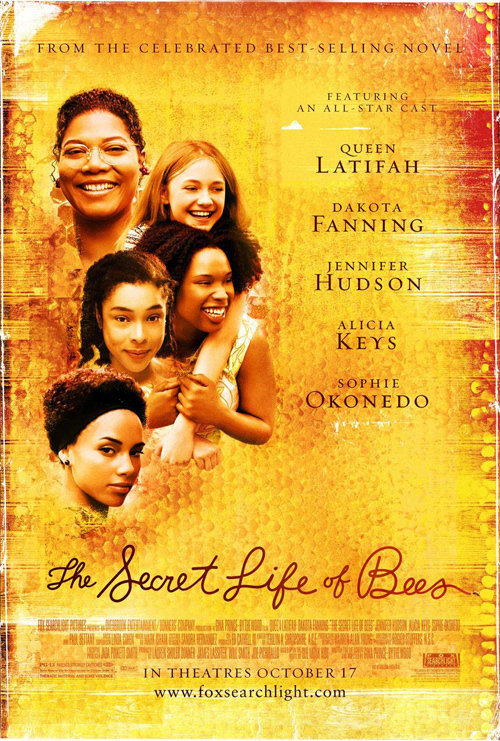 And then I saw the movie and though the actors did a pretty good job – it was hard to get past the fact that I knew them more as celebrities so that I wasn’t thinking “Oh look August is being played by Queen Latifah and there’s June played by Alicia Keys.” It was more like – “Oh look it IS Queen Latifah, AND Alicia Keys, oh and wait for it – Jennifer Hudson.” (Sometimes I miss the days of actors being actors and singers being singers – too much hyphenation going on…) What pleasantly surprised me was the casting of Paul Bettany as the dad, T. Ray– it was a nice surprise as it made the character more “human” in a way – but I think that’s just Paul Bettany (who I’ll watch in ANYTHING). So what about books to movies in general? It’s always a hit or miss. There a saying that good books make bad films. But that’s not always the case. Usually the books are always better because you can go deeper, interpret things a different way. Movies are confined to 2-3 hours so more often than not things are lost in translation. Sometimes you get lucky and the movies are as good as the books – think the Harry Potter series, although I must say some HP movies were better than the others but that’s another story. The Twilight books were a fun read but surely having the actors embody the characters in the story took the series up a notch. The books were easy reads – not too serious (can you really take vampires seriously?) but fun in a high school sort of way. Who doesn’t like reading about a doomed romance. Very classic Romeo and Juliet though the prose was rather how shall we say- prosaic. Watching the chemistry between the lead actors took it to another level and then there was the haunting soundtrack. Sometimes the books are better than the movies. Off the top of my head, I can think of The Da Vinci Code by Dan Brown, The Sisterhood of the Travelling Pants by Ann Brashares, and The Beach by Alex Garland (a personal fave in my 20s). I’m not sure if it was the screenplay, direction or casting that made these movies fail their source material but these are examples of poor movie adaptations. There are more and there are worse but I can’t think of any at the moment. And then there are the movies that are BETTER than the book: recently, The Devil Wears Prada by Lauren Weisberger (a book I totally thought wasted my time despite the fact that I could sort of relate to the subject matter) and something older –The Outsiders by SE Hinton. (But I think that’s because I was a kid and I thought the Brat Pack were cool). And finally, there are movies based on books done just right, in which the movies didn’t EXACTLY mirror the book but captured it’s essence and in some cases, even enhanced the story and made you go back and read the book with deeper insight. 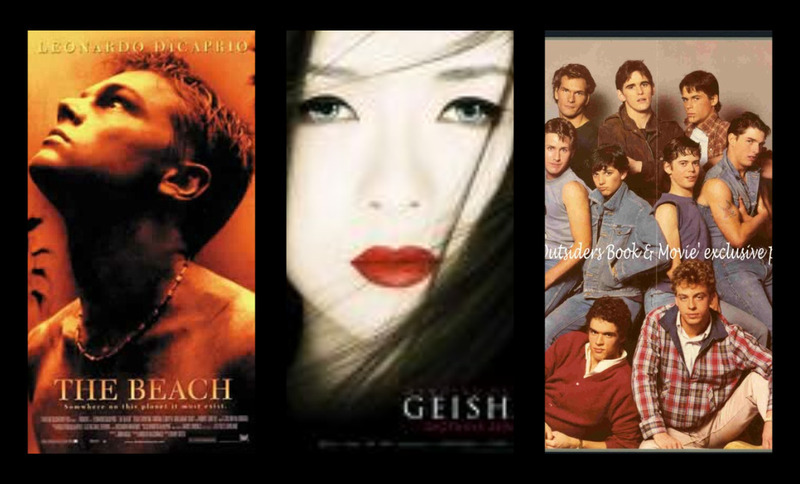 My current favorites: Memoirs of a Geisha, The Namesake, and Trainspotting. I could go on and wonder about such things as why most Jane Austen books turn out to be good movies or whether the Percy Jackson movie will do justice to the book. But it’s raining outside and I’ve got some free time –so I think I’ll grab a cup of coffee and curl up with a good book.